It's not too often that you find an off-track Thoroughbred that was unraced but didn't retire until he was five, but that's exactly what happened to the horse Joe Desoto. 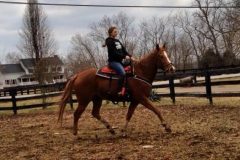 Sven, as he's known these days, was purchased for $500 by a pair of University of Kentucky students who have aspirations of competing with him in the Retired Racehorse Project's Thoroughbred Makeover this October. Sponsored by the Thoroughbred Charities of America (TCA), the Thoroughbred Makeover is a three-day competition at the Kentucky Horse Park October 23 through October 25 that allows professional, amateur and junior riders to show their skills in retraining off-track Thoroughbreds in one or two of ten designated divisions. Attendees also enjoy seminars, training demonstrations, a vendor fair and more, all focused on caring for and training retired racehorses for second careers. With cash and prizes totaling $100,000, there is a lot on the line and Sven is one of about 300 recently retired racehorses currently entered in the competition. “From what we've been able to find out, he breezed a few times, got hurt, and then was tried at the track again. Even though he didn't race, he is tattooed and definitely knows what it's like to be ridden like a racehorse,” said Jenny Terrazas, one of Sven's co-owners. Originally, Jenny and her friend, Hailley Stanz, were searching for a horse that Hailley could use for their college's rodeo team. Soon after beginning their search, the pair learned about the Thoroughbred Makeover and amped up their search, refining the criteria to off-track Thoroughbreds who were eligible to compete in the event. Sven, who was turned out for several months after he failed at being a racehorse, was found by the girls on Facebook listed as being for sale. The two of them loved his look and his description, and contacted the owner with questions and made an offer. 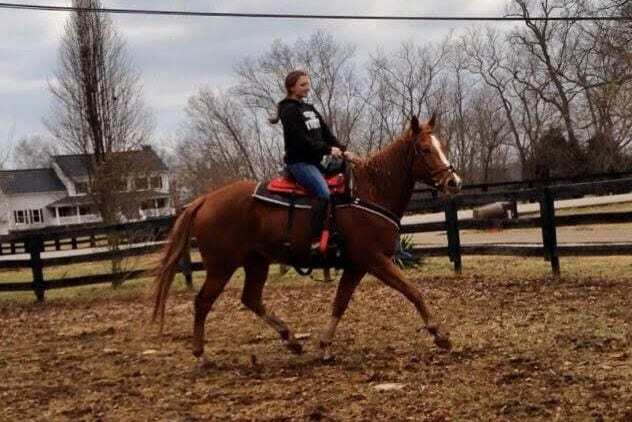 Both girls have other equine interests, with Jenny riding hunter/jumpers on her draft-cross and running barrels on a leased Quarter Horse mare and leased OTTB, and Hailley riding Saddlebreds her whole life but recently expanding her skills as a rider and a horseman with barrel racing. The first order of business when Sven arrived was to get some weight on him, get his feet done, get his teeth floated and give him time to acclimate to his new surroundings. “For the first bit of time, we took it easy with his retraining. We did a lot of ground work and when we rode him, it was in brief spurts of 15 minutes,” explained Jenny. In the first 30 days of riding him regularly, Sven was a dream horse. He learned flying changes easily and worked off of leg and seat without much fuss. 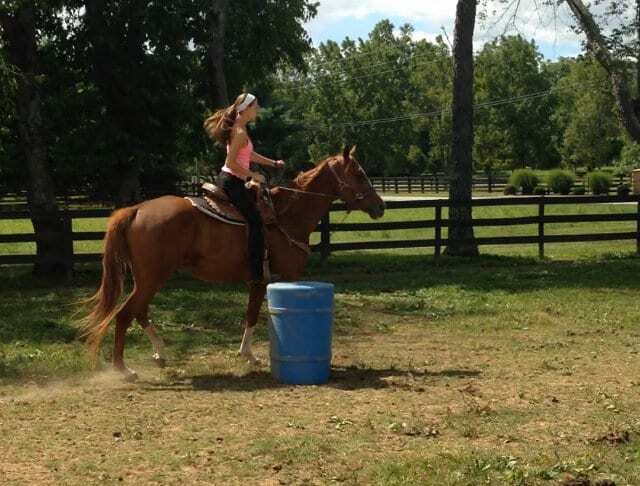 Jenny even started slowly riding him through barrel patters and poles. Everything seemed to be a breeze; that is until she pointed him at a jump. That's when the issues started. With all of the good care and food Sven was getting, his energy level skyrocketed and he started showing off his athleticism in non-productive ways. Hailley and Jenny often had to lunge him for 15 to 20 minutes before getting on his back just to have a semi-productive ride. “We had him checked by everybody – the farrier, vet, chiropractor, dentist – and he got the cleanest bill of health possible,” said Jenny. Jenny and Hailley decided to take a step back and return to ground work, and things started to improve, but with the college rodeo season and the Thoroughbred Makeover looming, they needed to get him back to work. The girls are planning to compete in the Thoroughbred Makeover with Sven in the barrel racing and freestyle disciplines, with Hailley likely piloting him around the barrels. 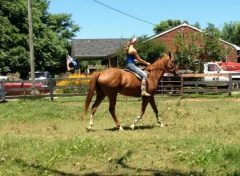 “Saddleseat is all about how you present yourself and your form, and how you look and work with the horse you're riding. I'm not going to lie – I'm a little excited that I don't have to worry about how I sit in the saddle – it's just about speed and accuracy,” she said. For the freestyle competition, riders can present their horses' skills in any disciplines other than the ten listed as the Thoroughbred Makeover's official event disciplines. The girls plan to both take part in the presentation, which will be based on the movie Frozen, with Sven playing the part of the reindeer. For both Jenny and Hailley, the competition isn't about winning. It's about the experience, both the weekend of the event and the months they've put into caring for, training and learning from Sven together. They've already gotten to know people from all over the country via social media who are competing in the Thoroughbred Makeover, and are looking forward to connecting and collaborating with them in October in an environment that is entirely geared toward their favorite passion – Thoroughbreds. 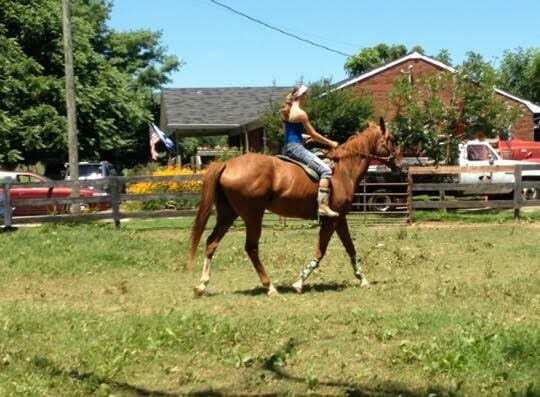 Once the Makeover is over, Sven will resume working toward the girls' original goal for him, which is being Hailley's horse for the UK Barrel Racing team. While Jenny was the one with previous Thoroughbred experience, it is Hailley who has decided to keep Sven. This entry was posted in OTTB Showcase Archive and tagged barrel racing, Cosequin presents OTTB Showcase, equine welfare, Horse Racing, Horse Welfare, Jen Roytz, Off Track Thoroughbreds, OTTB, thoroughbred, Thoroughbred aftercare, thoroughbred charities of america, Thoroughbred Makeover, thoroughbred racing, thoroughbred retirement, university of kentucky by Jen Roytz. Bookmark the permalink.